The happiness project is understanding what makes humans happy. We watched videos and read books like Brave New World to help us understand the phenomenon known as Happy. We also had to find how meaning fits into the meaning of happiness. Using the information we gathered from the videos and readings, we wrote an essay about happiness. After that, we created an art piece about it and had a socractic seminar about it. My happiness art piece is a vision board. It shows what I want to have in the future, but what I want less of. When you look at it straight on, the three pictures on the right side are the bad side. They show material wealth and technology. Everyone knows that material wealth is not the best thing for humans and that technology, mainly the internet, degrades humans in some way or another. That’s why I put them on that side of the board. The rest of the board is what makes me happy and also has the points I made in my essay. Knowing one's strengths, practicing an intrinsic life, and slowly, or all together, spending less and less time with technology. I also chose pictures of what I want to be in my future and some things that just make me happy, and also make other people happy from experiences. 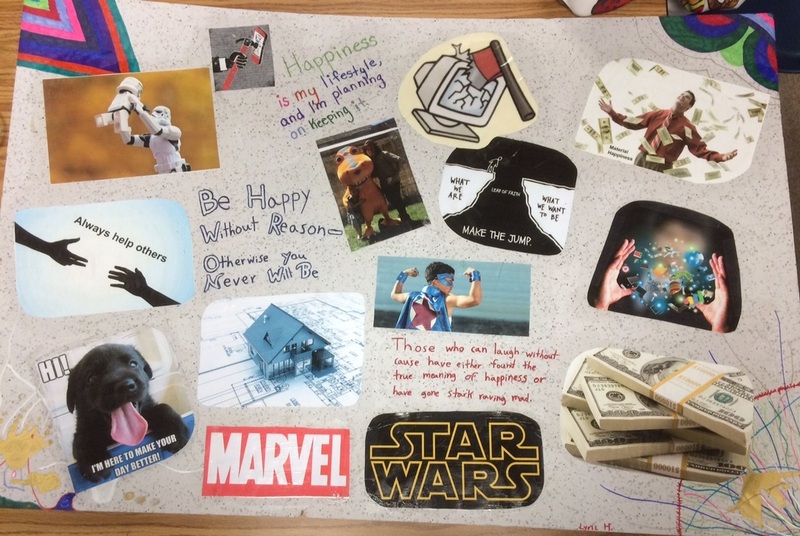 I chose to create this because I thought the vision board was a good way to say what makes me happy and also shows what my essay says about happiness. The Model United nations project was basically a scaled down version of the real UN except we had fake resolutions that we wrote. The end project was a mock-conference where we voted on a resolution we all agreed upon. The entire project contained two different topics we learned about. We started with North Korea, learned all about that, did a mock-conference in class on that topic, then learned about Israel-Palestine conflict and did a mock trial at the college on that topic. We each had to write a resolution, which the chairs then picked the top four for the conference to vote on. We also had to produce a speech to say out loud at the conference. 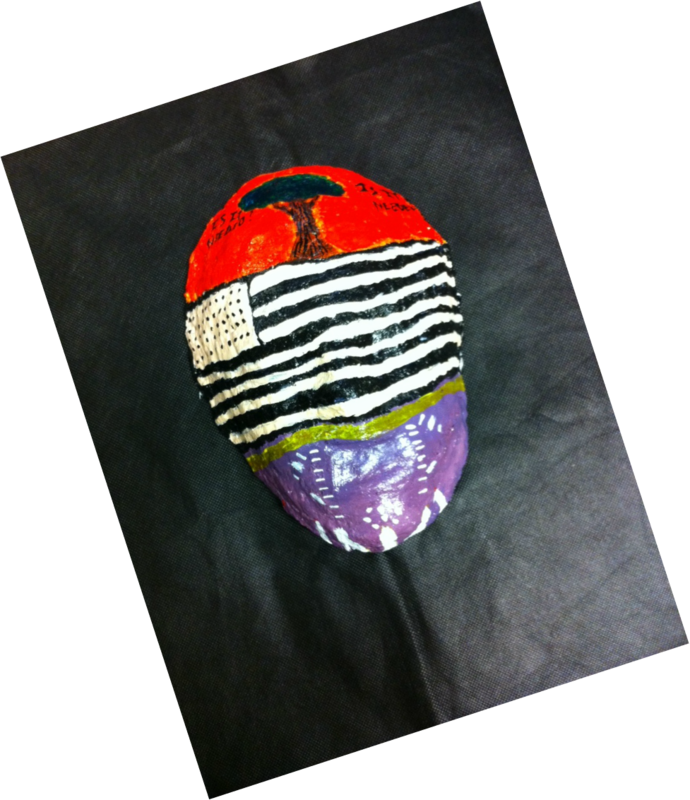 What would you tell another student if they asked why the MUN project was important? The MUN, Model United Nations, project is important because it shows a different look at a part of life we don't really hear about. In world issues, we hear the end result of the resolutions passed by the UN. The deaths, the new revolutions, the lives saved, thats what we see, but we don’t get to see about the process of how these problems arouse. In the UN, most to all countries come together and decide on a resolution to the problem. It really makes you take into consideration how each country feels about the matter at hand. Think of this project overall- which habit of mind were you most proud of using during the conference? I feel that the Habit of Heart and Mind that I was most proud of using was perseverance. I believe this because the conference was long and arduous, sitting through almost two dozen speeches and staying quiet and listening. I persevered through the points when it seemed like it was getting boring. I stayed interested and listened intently to the speakers. I am proud that I used it as well as I did. it could’ve been bad. I could’ve fallen asleep. But no. I stayed with it the entire time. What was the greatest challenge you faced in the project and how did you work through it? The greatest challenge for me in this project was speaking at the final conference. I stressed so much about it. The week before, the same day, and the first hour of the conference I stressed. The beginning of the second hour, I stopped. I became calm and really started to listen more. The stress came back right before I had to speak though. Public speaking is super hard for me and I would never wish it on my worst enemy. What was the most interesting speech, resolution, amendment, or comment by one of the delegates? The best speech that I heard was Russia’s speech. It had emotion and made me want to go with their resolution. They gave facts and backed up what they said. It mentioned how to solve all the problems that might arise when and if the resolution was adopted. The speech really made me have more interest in the end product of the conference. That was the resolution that was going to be picked. In the end of the conference, almost everybody voted for resolution 2D. That was Russia’s resolution. You can see that their speech really made sense as a logical solution to the Israel-Palestine problem. We started off this project by reading two Greek tragedies. Then we learned different writing techniques to write our own tragedies. Once we had the tragedy done, we created a visual component to go with it. Since the tragedy we wrote is so much like a script, we used it to make our visual pieces. Below is my visual piece followed by the tragedy itself, then a project reflection.